I was invited to speak at a small gathering of a dozen people who were sharing stories about angels, and how they played a role in our lives. Three years ago, I would not have been interested in angels or any discussions about them as back then, in 2011, I perceived angels as religious myths and felt that they were confusing extra-terrestrials for angels. However, as my healing experiments progressed, about two years ago I began listening to the podcasts of a woman from Florida named Linda who is both a healer and a channel of ascended masters and angels. Even though I come from a scientific background, I allowed myself to expand outside of my comfort zone by investigating her live channelings and meditations, which incorporated angels. I kept an open mind, and began to follow her meditations and guidance. After several months, I felt comfortable enough with what I was learning, and with a little courage, I started to feel less threatened by what anybody would think and say about the idea of me working with angelic beings. 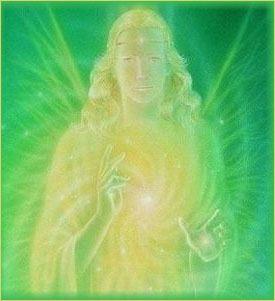 That’s when I began to call upon these angels and the colors of light associated with them during my healing meditations for people, and what I discovered was that I was getting wonderful results for the people who I was trying to heal while I was calling upon these angelic entities, along with my regular extra-terrestrial guides. Now, after four years of healing work, and two years of working with angels, I feel comfortable about publicly sharing my experiences with angels, even though I am not joined to any religions or churches, nor plan to be. I find myself in an in-between zone where people from churches don’t really get me because I call upon extra-terrestrials, and people from scientific or agnostic backgrounds who investigate extra-terrestrials don’t quite get me either because I work with angels, not to mention the average materialistic-focused people I know who want nothing at all to do with either ETs or angels. Yet, this openness I have to such a wide range of benevolence in the universe has allowed me to receive a multitude of special gifts and abilities which have helped me grow tremendously, and have also helped me to help people to heal and be relieved of their pain and suffering. So, there it is. I work to heal people via meditation and visualization with my extra-terrestrial guides and their civilizations, and ascended masters, and angels, and now I have a couple hundred people who would testify that I have helped to heal them of various pains, ailments and diseases. I know: I’m a strange lad. This Sunday’s angel meeting was created by a sweet woman named Sharon, who I met last summer through her friend Maria, after my wife and I were left out of the seating arrangements at a wedding. We decided to simply choose a table ourselves, met Maria, and got to talking with her about angels and extra-terrestrials in front of the other half at the table who seemed a bit flabbergasted by our conversation. Maria spoke to Sharon about me, and so last summer by invitation I met Sharon at one of her small gatherings, and that day I helped by healing one of the people there who was suffering from pain in her finger due to some glass embedded in it, as I recall. The healing removed her long-standing pain. So when Sharon was planning for this meeting, one year later, she said that her angelic guides had repeatedly advised her to invite me. She left a message for me at work, and I called her right back, to her surprise, since we had not communicated since last summer. But I contacted her quickly because I could feel her sincerity and thought that I could contribute by offering to do healings, if needed, for those at the small gathering. At the gathering, you could feel the quality of peace in the room that Maria had created when she had, on faith, taken over the spot in an act of faith some years ago. After all the healings and meetings that have occurred in her salon, you can feel the calm tranquility of that space upon entering. Sharon moderated the gathering, and allowed everyone to share their experiences and their wisdom gained from interacting with loving angelic beings. Besides my wife and I, there was another couple who attended the meeting who had also had numerous experiences with extra-terrestrial beings. One woman worked with reiki for horses and other animals. Another woman worked with the Archangel Sandalphon. Maria shared her stories of faith when she was in desperate financial straits, burdened by massive debt after a divorce, and the faith that kept her going. Another person was a healer who had survived a near-fatal car accident in June 2011 after being thrown from a car onto concrete, suffering multiple injuries that required major surgeries, and had also suffered multiple brain aneurysms from the accident. Now, she heals people. And there were several others there, some timid, who had mustered up the courage to go and listen and decide for themselves what they thought about angels and healing, instead of letting society or their peers pressure them into thinking one way or another about it all. So it was a really wonderful, well-mixed group, with wide-ranging beliefs and experiences and abilities, with the common interest of exploring and opening up to angels. I was fortunate enough to be given the opportunity to do four healings this day. The first one was for a person who was suffering from both depression and back pain, and after the healing, which I did in front of the group, she felt much better and later recommended me to others who joined the group later in the day. The second healing was for the healer who had gone through the terrible car accident, and I was able to help her with her back pain, shoulder pain and knee pain, and give her a much wider range of motion. We will know after an MRI whether or not the healing helped with a remaining brain aneurysm. I also did two other healings on Sunday: the third healing was for removing a persistent ear infection, relieving sadness, and an overall energy boost. The fourth healing was for someone who was already pretty healthy but was simply for greater energy and balance. Her healing was amazing, in that near the end of the healing I saw something I had never seen when doing a healing, which were four rainbows from the four directions pouring into the top of her head through her crown chakra. Regarding technique, what was common among all four was that I asked each person to visualize the sparkling white” galactic-center” white light filling up their bodies in order to help make them most receptive to the healing light energies I would visualize. Also, with all four people, I began the healings by cupping their head in my hands (for balance, clear thinking, and a state of mental openness), then moving my right hand just above their heart chakra and my left hand on the corresponding point on their back (for comforting, soothing, self-love, calming, and nurturing) , then I moved my right hand to their spinal column to work on the seven major chakras, and then finally I moved to each individual person’s areas of special need. One person loved the visualization of a golden pillar of light reaching from the center of the Earth out to infinity. Another person had so much strong light that I felt the energy might be unnerving to some of the person’s family and friends, because they didn’t know how to deal with such strong energy. Each person’s healing is different, and I never know exactly what to expect. I listened carefully to what their issues were, and used my clairaudience to hear the unspoken messages. I visualized positive outcomes, and put complete trust in my guides, the ETs and the angels to do the healing work, of which I act as a conduit, while at the same time adding my compassion and love. I helped one person connect up with one of their guides for the first time, which she felt was a native-American male spirit being. During each healing, I would stop and ask the individual to re-assess how they were doing, and what areas still needed attention, and I took as long as needed until each person was completely satisfied and no longer in any pain. The shortest healing was about seven minutes, and the longest one may have been just over half an hour. It all seems to benefit them wonderfully: I love seeing all their smiles afterwards and receiving their hugs of appreciation! So much was shared over about four and a half hours, and several of us are going to gather again this Friday for a special meeting with about thirty or forty other people who are going to participate in the 4th monthly gathering of people who experience a very benevolent entity who is channeled through a crystal skull named Synergy by a delightfully loving psychic named Sherry, of whom I will write about in an upcoming article. Last time, at the 3rd meeting, we all did drumming and some very special, uplifting chanting. That meeting I brought two longtime friends of mine, a couple. He’s somewhat of a skeptic, but after he touched the crystal skull Synergy, his ears would not stop ringing until late the next morning. His wife, who has psychic abilities, felt Synergy’s presence immediately after touching the skull, which she described to her daughters as “intense.” They loved the new and powerful experience. I really enjoy those gatherings with Sherry and Synergy. He Said She Said She-Shells by the She-Sore… huh? He Said What?? $75 per hour; 60 or 120 minutes sessions only. So you like these, ay?